This afternoon, the Skerries Coast Guard crew dropped over to the Skerries RNLI station to attend the naming ceremony and service of dedication for the new Skerries Lifeboat “Louis Simson”, an Atlantic 85. Mr Leo Cody, one of the founding members of Skerries RNLI, had the honour of officially naming the lifeboat. The Skerries Coast Guard team extends their best wishes to the crew of Skerries RNLI on their new lifeboat. Photos of the event will shortly be posted in our online gallery. Earlier this afternoon, the Coast Guard’s National Operations Centre received a report of a person possibly requiring assistance near Skerries harbour. 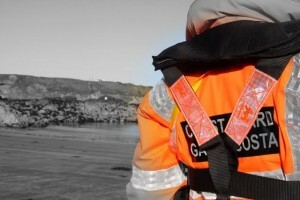 The Skerries Coast Guard team were paged to the scene. The Dublin based Coast Guard helicopter was tasked to the scene along with Skerries DFB. The casualty was quickly located in the area by all units and the helicopter winched its paramedic winchman down to the scene. After assessing the casualty’s condition, it was decided that a helicopter evacuation was not required. 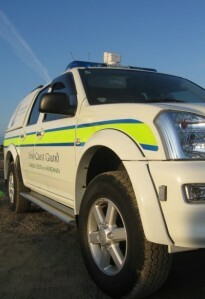 At 04:52 this morning the Skerries Coast Guard were tasked to investigate a report of pollution in the area of Skerries harbour and the nearby North Beach. A concerned member of the public had contacted the Coast Guard’s operation centre to report one of the fishing vessels at the harbour had sunk during the night and had resulted in oil pollution in the area. The team inspected the area of the vessel, a small razor clam fishing vessel, and also carried out extensive searches of the nearby shorelines These inspections found some diesel appeared to have leaked from the vessel. The owner of the vessel arrived on scene and confirmed that only a small volume of diesel was onboard. 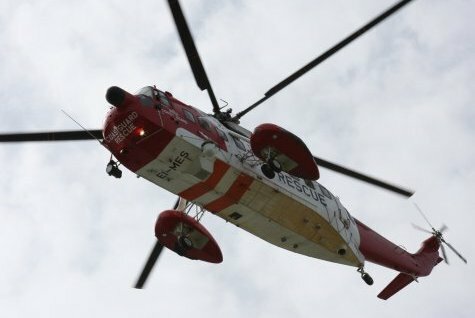 The Coast Guard’s Dublin based Sikorsky helicopter, Rescue 116, was tasked to carry out aerial inspections of the area and confirmed only minor scale pollution in the area of the harbour. Fingal County Council were notified of the incident. At 17:00 the Coast Guard’s operations centre received report of a possible swimmer in difficulty in the area of Colt Island, Skerries. The Skerries Coast Guard team were tasked to investigate and the Skerries lifeboat was also launched. Conditions in the area were difficult for swimming, with a strong Spring ebbing tide. Fortunately the situation was quickly resolved, as a nearby kayaker assisted the swimmer in reaching the safety of the South Strand shoreline.